Ledbury, UK — Wind lidar technology innovation company ZephIR Lidar is proud to announce the release of a fully-marinised wind lidar – ZephIR 300M – for the offshore wind and meteorological industries, founded on the company’s successful and finance-approved remote wind measurement device, ZephIR 300. ZephIR is the single most experienced lidar operating offshore with extensive global offshore deployments across a 10 year track record including: the world’s first wind lidar to be used on a fixed platform; the world’s first wind lidar to be used on a floating platform; the first wind lidar to be accepted as DNV GL Stage 3 ‘bankable’ on a fixed platform, and; the world’s first wind lidar to be deployed as standard in dual configuration on a buoy for resource assessment. 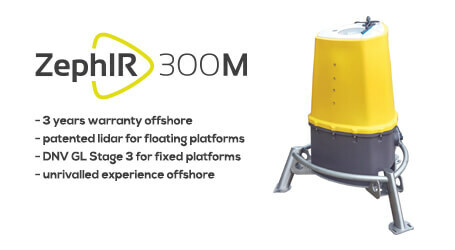 ZephIR has been selected by over 90% of all floating platform installations due to the unique properties this continuous wave lidar technology has to provide including range of measurements (10 – 200 metres from installed height), the fast data rate of 50Hz leading to natural resistance to the motion found offshore completely removing the need for mechanical motion compensation in most environments and its proven reliability offshore. ZephIR 300M provides 10 metre to 200 metre wind measurements ideal for site resource assessment offshore, power curve measurements and bankable Annual Energy Prediction (AEP) campaigns at the lowest cost of finance-grade lidar ownership available with no requirement for annual servicing or calibration within the 3 year service period. If you are developing, operating, optimising or researching within the offshore wind industry, download the ZephIR 300M product brochure here. © 2015 Zephir Ltd. All rights reserved. ZephIR, Zephir, ZephIR 300, ZephIR 300M, ZephIR DM, ZephIR Care, ZephIR Power and Waltz are trademarks of ZephIR Lidar. Other company and product names may be trademarks of their respective owners.